Just in time for Christmas, Eidos Montreal has released two new pieces of concept art for Deus Ex: Mankind Divided showing our hero's living quarters for the new game. In Human Revolution, the apartment was packed with little environmental details that hinted at Jensen's lifestyle and mental state. Secrets included a hidden weapons cache and a heartbreaking story about his dog, Kubrick. "The core of Adam's apartment is once again inspired by the cyber renaissance theme, although darker than what it was in Human Revolution" explains EM on the Deus Ex site. "These two concepts are only the tip of the iceberg and there will be a lot more details to find". Here's the first image of Jensen's living room. This one shows Jensen's bedroom. Who would live in a flat like this? Ah, the entirely healthy sight of two empty bottles of Jack Daniels within couch reaching distance. There's another bottle and a half-filled tumbler by the bed in the second piece of concept art. Jensen always has whiskey within arm's reach, which means his lifestyle hasn't come far from this piece of early Human Revolution art. The cereal box (Magic Gnome: Suspiciously Delicious! ), toilet paper, empty dish and sleep-crumpled blanket hint at Jensen's entire day-night cycle. The pale glow emanating from the left hints at a television screen, but I like to think that Jensen simply spends his hours staring deep into a blank wall brooding and flicking his shades on and off for fun. The coat stand is empty, even though Jensen owns approximately 3,000 coats. They're strewn all over the apartment. Jensen sharpens up well when he's out, but this is the apartment of a messy bachelor who still hasn't completely unpacked his stuff, and never will. You can see form the angle of the telescope that this is definitely for spying on others outside his building, not stargazing. As an enemy of the illuminati, Jensen has reason to be paranoid. This telescope can actually be found in the corner of his Human Revolution apartment, to the right of his television. In Human Revolution, it was folded away. The fact it's set up here suggests Jensen's more wary. It's always within reach of his little workstation at the dining table. This is a sign of progress at least—an unbroken mirror! In Jensen's last apartment his toilet mirror was smashed by, presumably, the punch of one of Jensen's big metal arms. Jensen is at least able to look at himself without flying into a despairing age. 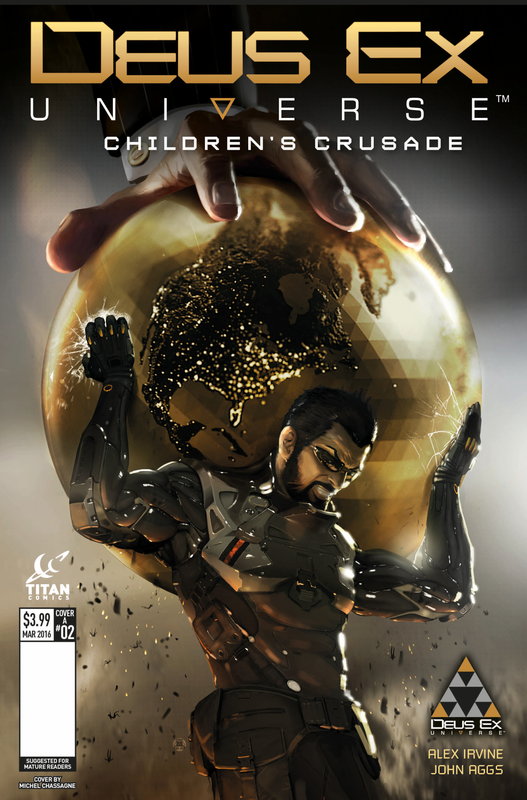 It's hard to tell what the ball on the left is at this distance, but it's probably a golden globe, as seen on this cover of an issue of the Deus Ex Universe comic in which Jensen squats, Atlas-like, under the pressing palm of the Illuminati—symbolism! I bet we'll see the globe imagery appear a few times in Mankind Divided. The globe-in-a-fist imagery has been part of Deus Ex since the first game. On the right, a reading light. We see that Jensen is a big reader, even if he can't put up a bookshelf. The book titles are illegible in this piece of concept art, but they'll surely be clear in the final game. Jensen's Human Revolution apartment was full of books, including encyclopedias, "Cars of Detroit", "Narcotics" and "CHILD AND VIOLENCE". Jensen is man of diverse interests and eclectic taste, but his obsession with watchmaking and tinkering in the last game has given way to a fondness for art. As well as the gold globe in the last picture, the bedroom also features a this piece, and the living room has a nice horse. In Human Revolution Jensen's obsession with the internal working of gadgets allowed him to work through his cybernetic body issues, that seems to have faded as he's come to terms with himself, and he's moved on to different forms of expression. That, or the paintings were there when Jensen bought the apartment, and actually he's taken them down to replace them with target practice sheets. Human Revolution's aesthetic was built around the idea of a cyber-renaissance, and Jensen's clearly intended to embody the ideal of the Renaissance Man—a figure of eclectic tastes, who excels physically and intellectually. You explore Jensen's physical capabilities through play, so it's up to environmental details like these to fill in the rest of Adam's personality. However, I have no idea what this is, below the lightsaber candelabrum, to the left of the half-finished bottle of whisky. Alarm clock? Rubbish origami swan?